1463 Is considered the year that the painting was finished. This is based upon the last words being "Anno Domini MCCCCLXIII in vigilia Assumcionis Marie", which means the evening before the day of Mary's Ascension, 14th august 1463. The text doesn't say clearly that the work was finished that day, and since the year 1463 was a plague year, it might as well be the year that the work was begun. The artist is assumed to be Bernt Notke. The author is unknown. 1489 Publication of Des dodes dantz. 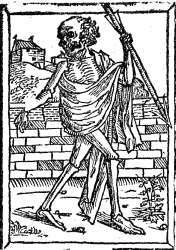 1550 Publication of Copenhagen's Dance of Death (approx.). Anton Wortmann executed the new painting and copied persons, backgrounds and clothing carefully. A new text in High German, written by Nathanael Schlott replaced the old Low German text. 1738 Publication of Den Lybekske Dødning-Dantz - a Danish translation of Schlott's poem. This book is available in the Danish section only. 1783 The first person to reproduce the painting was Ludewig Suhl. 1799 A door in the church wall was expanded. In order to make room, a piece of the painting was cut out, namely the duke and one Death. 1852 The last person to restore the painting ever was by C. J. Milde, who then made a drawing of the painting, which is said to have surpassed all other reproductions. This drawing disappeared (like many other things) during World War II. 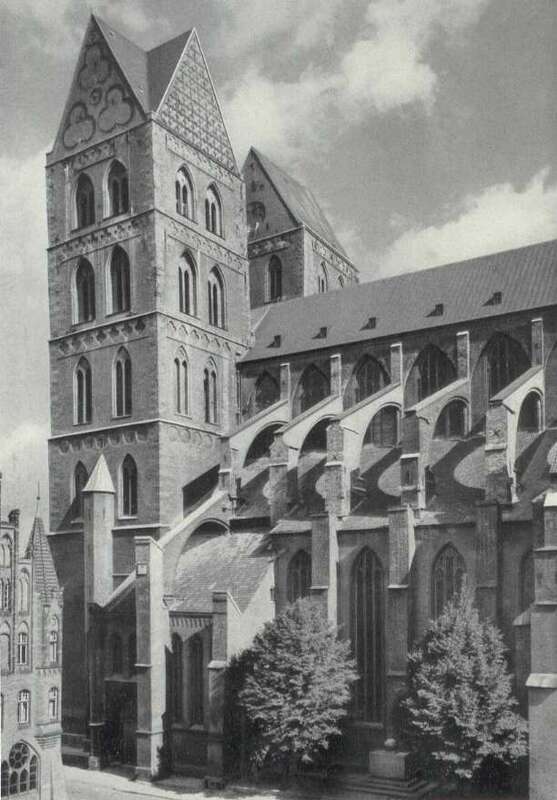 1866 The serious research starts with Wilhelm Mantels publishing Der Todtentanz in der Marienkirche zu Lübeck. The book included Milde's drawing - reproduced as 8 black and white lithographs. 1868 The first person to make a colour reproduction (primitive as it may be) was Robert Geißler. 1942 Arthur "Butcher" Harris was appointed chief of English Bomber Command and chose Lübeck to test the new program of terror bombing(1). 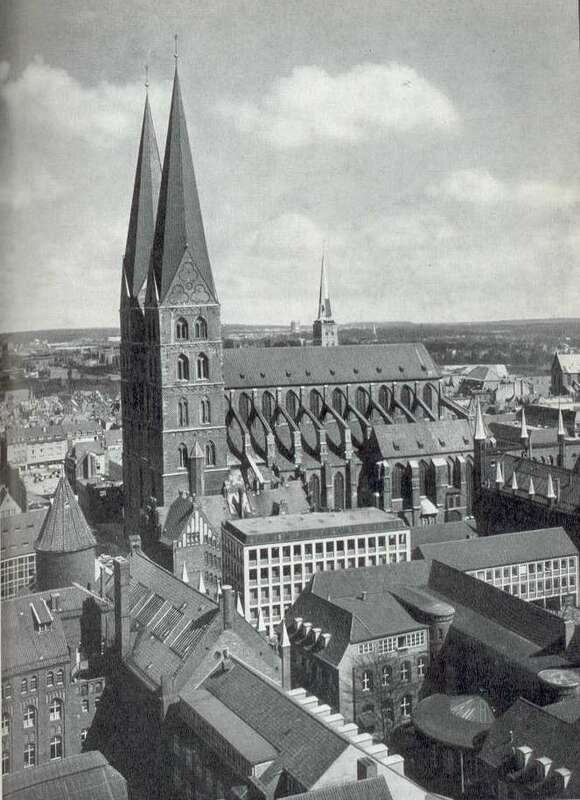 Lübeck, having no military importance, was selected because its timbered, medieval buildings made it a good target for incendiaries. 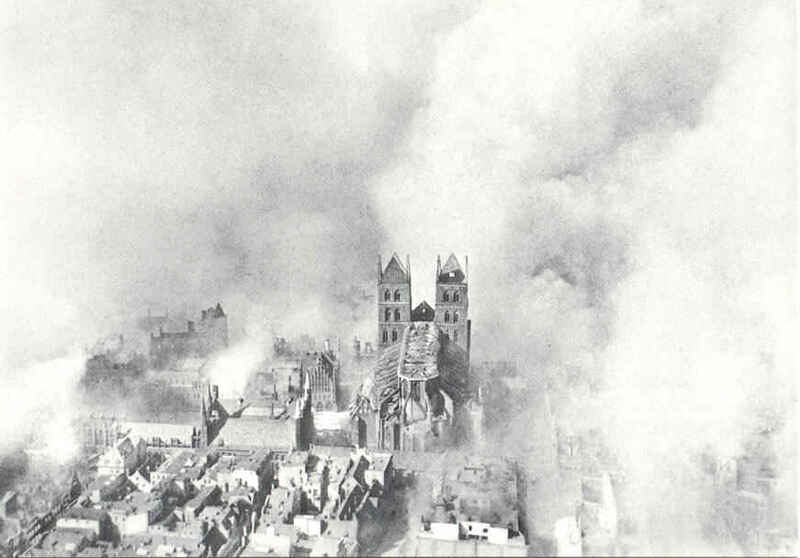 Lübeck was bombarded Palm Sunday(2), the night between March 28th and 29th. 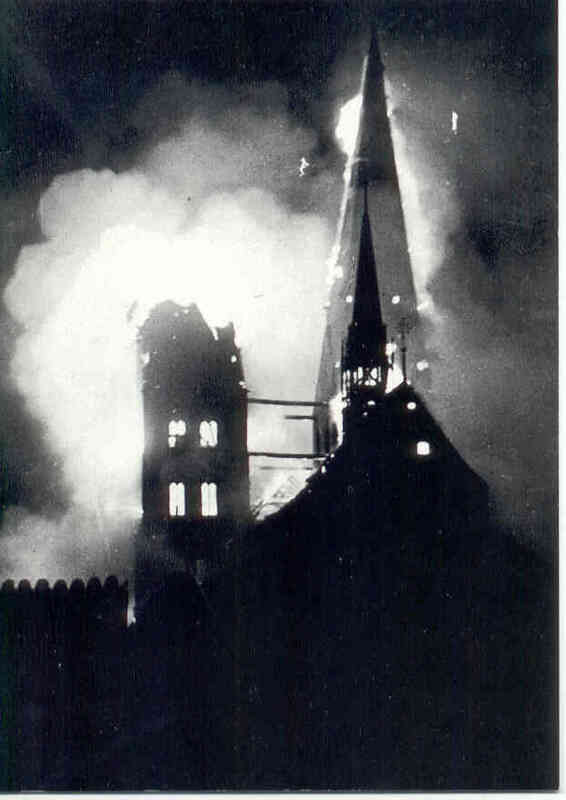 The church of St. Mary was hit and the painting was destroyed. 1952 Between 1952 and 1956 Alfred Mahlau created two stained glass windows in the chapel of the dance of death. 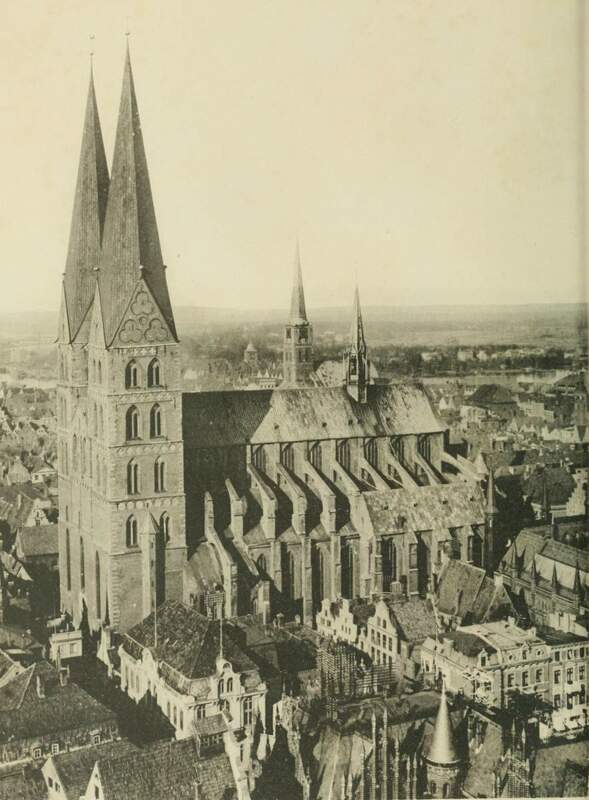 The photos show St. Mary's Church before and after the war. Three of the pictures are taken from the tower of St. Peter's Church, and here the spire from St. Jacob's Church can be seen in the background. Notice that on the fourth picture, the ridge turret on the roof of St. Mary's is still missing. St. Mary's seen from St. Peter's, ca. 1906. After the war. Notice the missing spires. A comparison of picture 1 with picture 4 and 5 reveals that St. Mary's Church has been restored to its former self but that, unfortunately, this is not true for all the buildings surrounding the church. England has a long and glorious tradition of bombarding civilians (Copenhagen, 1807), but during 2nd World War the Anglo-American air forces really put the "city" in "atrocity". See Bombs on Britain and Wartime Atrocities. Selecting a holiday for the attack was no accident. Holidays and fairs were preferred in order to increase the terror.